You know I'm in the middle of my mid-terms or finals when there is so much dead space going on over here...so sorry about that. I didn't mean to leave you all hanging! But my final is over, I think it went well- of course there is more I could have done but there are only so many hours in the day. I have two weeks of freedom before my summer class starts and I am so excited to relax and get those 1,000 projects on my list tackled started. Anywoo, while I get my desk cleaned up and my act together I thoght I would post the sources that I promised you all last week. This space started off with my new fabric obsession. The Manuel Canovas Dara fabric. I think it could be a new favorite like the Chiang Mai craze. I think that's everything for now. Happy Thursday everyone! 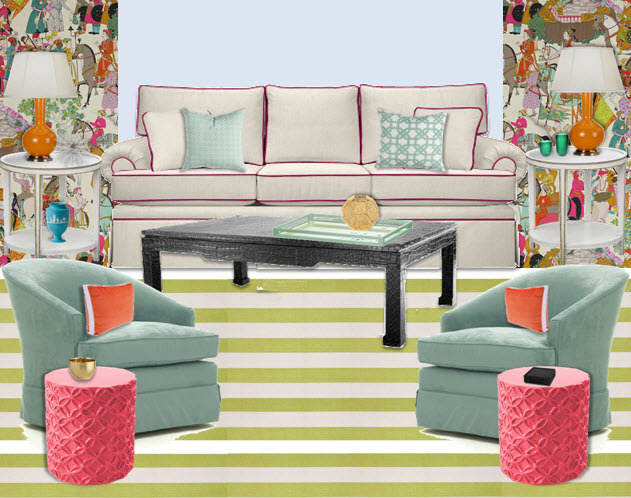 This is such a fresh, fun room you created! the couch?! where is that fabulous couch from?! Love your blog. read often but never comment. I came across a pin on pinterest from your blog but it just links back to your main page and I've tried searching several terms but can't find the associated post. You don't happen to remember what post or source this image came from, do you? BIG thank you! Stephanie, that photo is from Lauren Liess's home, its her little boys room- I love Lauren and her blog! You can find her at Pure Style Home. yes, where is the sofa from???!! !